I quite often pick up these chocolatey desserts from Cadbury as a treat. One half of the pudding has a thick chocolate sauce, and then there is another Cadbury ingredient that can be mixed in with it. There are quite often limited edition flavours, and this Daim edition is the latest. 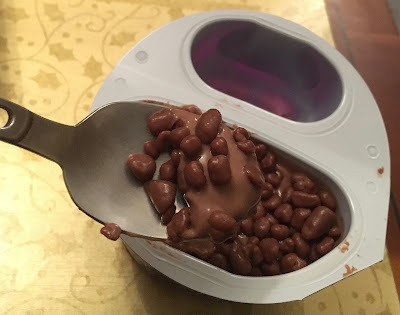 We had these as a pudding after tea. When I pulled back the lid I found the Daim bits in one section of the pot, they looked quite small, and were coated in chocolate. I tried a combination of both the dessert section and the Daim bits and found it to be mainly chocolate in flavour. There was a slight crunchy from the Daim, but the overwhelming taste was chocolate. The tones were sweet and creamy, and I do like Cadbury chocolate but the Daim flavour was so subtle, it was over powered by the chocolate coating. I could pick up the Daim flavour at the end of each mouthful, but apart from a little bit of texture the pieces didn’t add much. What it needed was for the Daim pieces to be pure Daim, without the chocolate coating. I guess they would have stuck to each other though, which is why they went for this option. 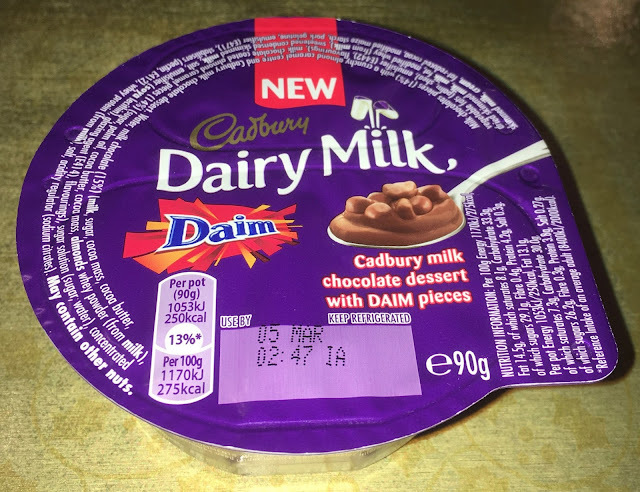 This is a nice dessert because of all the wonderful Cadbury chocolate flavour, but I felt there wasn’t enough Daim flavour for my tastebuds.